Brighton’s Duke of York’s Cinema was opened on 22nd September 1910, on the site of the Amber Ale Brewery. It was fitted with 800 tip-up seats in a carpeted auditorium, priced at 3d, 6d and 1/-. Boxes cost 2/- 6d. Below, you can see my Rover parked outside. This 1919 Rover is in excellent condition, being fitted with a BSA three-speed hub, an option at the time, for ease of use. The paintwork is unrestored and appears to be original. The first Rover prototype 8hp was completed on 1st July, 1904. 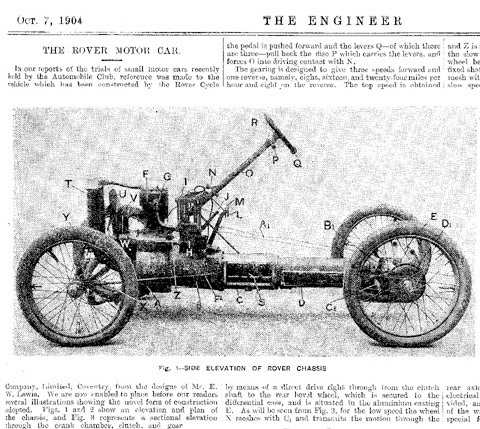 Rover’s 8 hp went on-sale on 1st December 1904 and featured a novel backbone chassis construction, uniquely including the rear axle and became Britain’s best selling car (before the arrival of the Longbridge built Austin Seven). Bicycle design today has not changed much since the introduction of the Rover Safety Bicycle in 1885. The year 1885 is a landmark year in the history of bicycles, and it is generally held that this was the first bicycle of this design, even though cycles with similar features had been around since 1878. The new ‘Patent Rover Safety Bicycle’ made its public debut between 18th January and 3rd February 1885, at the Stanley Show, in a marquee erected near Blackfriars Bridge. You can see my friend’s restored 1886 Rover, below. (Understandably, it lives in the spare bedroom in his house). At that time bicycle models were somewhat dangerous penny-farthings and high-wheel tricycles. The Safety Bicycle was lower and more stable, so for the first time the public did not require specialized skills to ride one. In 1870 James Starley produced the “Ariel” High Wheeler (aka “Ordinary” or “Penny Farthing”). Later versions had front wheel sizes of up to 5 feet. In 1877 James Starley patented a differential gear to allow his tricycles to corner properly; probably the first for a bicycle but the principle was not new. The inventor of the safety bicycle was claimed to be Harry John Lawson: his lever safety bicycle of 1876 is exhibited at the Coventry Transport Museum and his patent was registered on 30th September 1879. Lawson had been instructed by a relative to make his bicycles safer and this he set out to do. Harry Lawson also claimed that he invented the first petrol powered motorcycle, patented that on 25th June 1880. He also claimed to have been responsible for the repeal of the act that insisted on all motor vehicles being preceded by a man with a red flag. There is no doubt that Lawson wanted to totally control both the cycle and motor vehicle market but he was later sentenced to a years hard labour for fraud. He was undoubtedly at the forefront and one of the pioneers of motor transport but it seems he was also prone to exaggeration and sharp practice at times. 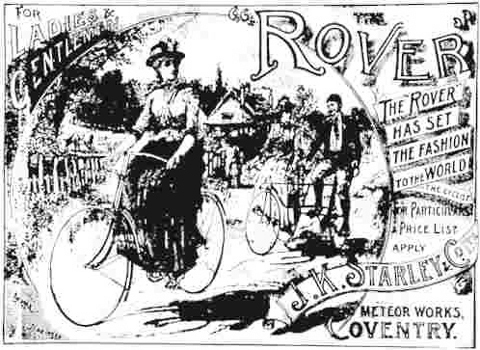 Nevertheless, the Rover was the first safety bicycle in production. 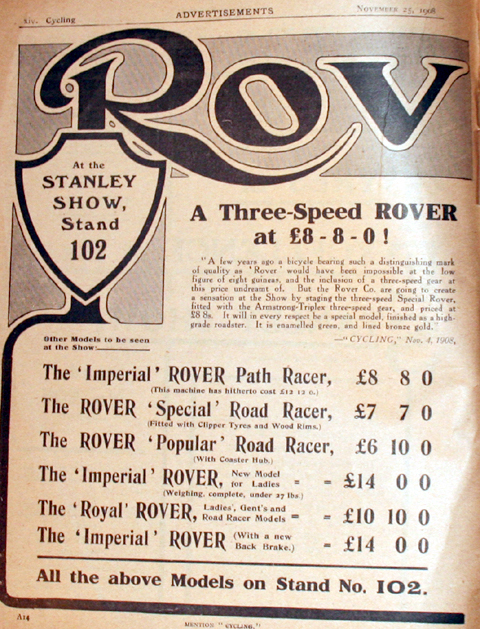 John Kemp Starley, its designer, and his partner William Sutton started The Rover Cycle Company Ltd in 1877. The Meteor Works were set up in Coventry to produce the machines. The factory was named after the Swift Comet of 1883. Bicycles had already achieved more or less their optimum design specifications by the beginning of the twentieth century (see my 1901 Imperial Rover, above). But cars, of course, were only just beginning. In 1904 the Rover Cycle Co brought out their first car, below. Bicycles truly paved the way for the automobile. Road construction was already in full swing, and mass-production already employed by the cycle manufacturers who turned to car production. By the end of the decade the roads were full of cars, lorries and buses and cyclists had to fight road congestion. ‘In our reports of the trials of small motor cars recently held by the Automobile Club, reference was made to the vehicle which has been constructed by the Rover Cycle Company Limited, Coventry, from the designs of Mr E.W Lewis. A public company, the Rover Cycle Co, was registered on 13th June, 1896, by John Kemp Starley to take over the business of J. K. Starley and Co.
As you can see below, in the June, 1896 edition of a Chicago magazine, the Carson-Pirie Monthly, a local company, The Wilkinson Co, of 83 Randolph St, sold Rover bicycles in the USA, including a No 3 Men’s and a No 4 Ladies. In England it was known as the Ladies Popular Rover. This page is dedicated to the team of film enthusiasts who ensure that this fabulous local picture house is still running over 100 years since opening. As well as hosting one of the oldest operational picture houses, Brighton was also the home of two important pioneers of the moving image. As with the development of the bicycle, patent law played a major part in its evolution. Unfortunately, as you will read below, patents lodged by William Friese-Greene and George Albert Smith subsequently adversely affected the fortunes of each other. Brighton resident William Friese-Greene (7th September, 1855 – 5th May, 1921) was a pioneer of motion pictures, credited by some as the inventor of cinematography. He lodged many patents, including the interesting 1898 patent illustrated above, for displaying motion pictures on surfaces such as a hat. On June 21, 1889, Friese-Greene was issued patent no. 10131 for his ‘chronophotographic’ camera. It was apparently capable of taking up to ten photographs per second using perforated celluloid film. A report on the camera was published in the British Photographic News on 28th February, 1890. On 18th March, Friese-Greene sent a clipping of the story to Thomas Edison, whose laboratory had been developing a motion picture system known as the Kinetoscope. The report was reprinted in the 19th April, 1890 issue of Scientific American. Friese-Greene gave a public demonstration in 1890 but the low frame rate combined with the device’s apparent unreliability made an unfavourable impression. In the early 1890s he experimented with cameras to create stereoscopic moving images but met with limited success. Friese-Greene’s experiments in the field of motion pictures were at the expense of his other business interests and in 1891 he was declared bankrupt. To cover his debts he sold the rights to the ‘chronophotographic’ camera patent for £500. The renewal fee was never paid and the patent eventually lapsed. Friese-Greene’s later exploits were in the field of colour in motion pictures. Working in Brighton, he experimented with a system known as Biocolour. This process produced the illusion of true colour by exposing each alternate frame of ordinary black and white film stock through two different coloured filters. Each alternate frame of the monochrome print was then stained red or green. Although the projection of Biocolour prints did provide a tolerable illusion of true colour, it suffered from noticeable flickering and red and green fringing when the subject was in rapid motion. Friese-Greene found it impossible to exhibit Biocolour motion pictures because a rival system – developed by George Albert Smith and Charles Urban and known as Kinemacolor – claimed that any colour film was an infringement of their prior patent. With the financial assistance of the renowned British racing driver Selwyn Francis Edge, Friese-Greene attempted to invalidate Urban’s patent in court. Friese-Greene claimed that the patent did not contain enough detail to encompass the Biocolour process. The judge ruled in Urban’s favour, but an appeal in the House of Lords in 1914 reversed the decision. Friese-Greene’s system was still in its infancy and he was unable to exploit this success. His son Claude Friese-Greene continued to develop the system during the 1920s. Claude went on to become a successful cinematographer. A strange footnote is that the British Film Institute made a a romanticised account of Friese-Greene’s life, filmed as part of the 1951 Festival of Britain. Named The Magic Box, it starred Robert Donat. Unfortunately, it was not premiered until the Festival was nearly over, and only went on full release in 1952. Despite an all-star cast and a great deal of publicity, the film was a costly box office flop. Friese-Greene’s former home in Brighton’s Middle Street was refurbished in 2006 and is now home to the offices of Worth, a leading media company. The building bears a plaque commemorating Friese-Green’s achievements. The plaque was unveiled by Michael Redgrave (one of the stars of The Magic Box) in September 1957. George Albert Smith (4th January 1864 – 17th May 1959) was a showman, astronomer, inventor, and one of the pioneers of British cinema, best known for his controversial work with Edmund Gurney at the Society for Psychical Research. His short films from 1897-1903 pioneered film editing and close-ups; he also developed the first successful colour film process, Kinemacolor. Although, Smith was born in London, he moved with his family to Brighton, where his mother ran a boarding house on Grand Parade, following the death of his father. It was in Brighton in the early 1880s that Smith first came to public attention touring the city’s performance halls as a stage hypnotist. In 1882 he teamed up with Douglas Blackburn on a muscle-reading, in which the blindfolded performer identifies objects selected by the audience, and second sight act, in which the blindfolded performer finds objects hidden by his assistant somewhere in the theatre, at the Brighton Aquarium. The Society for Psychical Research (SPR) accepted Smith’s claims that the act was genuine, although Blackburn later admitted that it was a hoax, and after becoming a member of the Society he was appointed private secretary to the Honorary Secretary Edmund Gurney from 1883 to 1888. In 1887, Gurney carried out a number of ‘hypnotic experiments’ in Brighton, with Smith as his ‘hypnotizer’, which in their day made Gurney an impressive figure to the British public. Since then it has been heavily studied and critiqued by Trevor Hall in his study The Strange Case of Edmund Gurney. Hall concluded that Smith (using his stage abilities) faked the results that Gurney trusted in his research papers, and this may have led to Gurney’s mysterious death from a narcotic overdose in June 1888. Following Gurney’s death his successors, F.W.H. Myers and F. Podmore, continued to employ Smith as their private secretary and he co-authored the paper, Experiments in Thought Transference for the Society’s journal the following year. In 1892, after leaving the SPR, he acquired the lease of the St. Anne’s Well Gardens in Hove, which he cultivated into a popular pleasure garden and, from 1894, staged public exhibitions of hot air ballooning, parachute jumps, a monkey house, a fortune teller, a hermit living in a cave and magic lantern shows of a series of dissolving views. Smith also presented dioramic lectures at the Brighton Aquarium, where he had first performed with Douglas Blackburn in 1882. Smith’s skilful manipulation of the lantern, cutting between lenses (from slide to slide) to show changes in time, perspective and location necessary for story telling, allowed him to develop many of the skills he later put to use as a pioneering film maker developing the grammar of film editing. Smith had attended the Lumière programme in Leicester Square in March 1896 and, spurred on by the films of Robert Paul, which played in Brighton for that summer season, he and local chemist James Williamson acquired a prototype cine camera from local engineer Alfred Darling, who had begun to manufacture film equipment after carrying out repairs for Brighton-based film pioneer Esme Collings. In 1897, with the technical assistance of Darling and chemicals purchased from Wiliamson, Smith turned the pump house into a film factory for developing and printing and developed into a successful commercial film processor as well as patenting a camera and projector system of his own. Both he and his neighbour Williamson would go on to become pioneering film makers in their own right creating numerous historic minute-long films. On March 29 1897 Smith added animated photographs to the end of his twice daily programme of projected entertainment at the Brighton Aquarium as an outlet for his burgeoning film production. Many of Smith’s early films, including The Miller and the Sweep and Old Man Drinking a Glass of Beer (both 1897) were comedies thanks to the influence of his wife, Laura Bayley, who had previously acted in pantomime and comic revue. However Smith also corresponded with special effects pioneer Georges Méliès whose influence can be seen in The X-Rays and The Haunted Castle (both 1897) the later of which, along with The Corsican Brothers,Photographing a Ghost and, perhaps his most accomplished work from this time, Santa Claus (all 1898), include special effect’s created using a process of double-exposure patented by Smith. Many of Smith’s films were acquired for distribution by Charles Urban for the Warwick Trading Co, and the two began a long business relationship with a joint show of Smith and Méliès’ films at the Alhambra Theatre, Brighton in late 1898 and early 1899. In 1899 Smith, with the financial assistance of Urban, constructed a glass house film studio at St. Ann’s Well Gardens, ushering in a highly creative period for him as a film maker. That year he shot the single scene The Kiss in the Tunnel (1899) which was then seamlessly edited into Cecil Hepworth‘s View From an Engine Front – Train Leaving Tunnel (1899) to enliven the staid phantom ride genre and demonstrate the possibilities of creative editing. The following year he experimented with reversing in The House That Jack Built (1900), developed dream-time and the dissolve effect in Let Me Dream Again (1900) and pioneered the use of the close-up with Grandma’s Reading Glass, As Seen Through a Telescope and Spiders on a Web (all 1900). In 1902 Smith collaborated with old friend Georges Méliès at the Star Films studio in Montreil, Paris, on a pre-enactment of the Coronation of King Edward VII and Queen Alexandra commissioned by Charles Urban of the Warwick Trading Company after rival company Mutoscope and Biograph acquired the rights to film the actual event. In 1903 Charles Urban left the Warwick Trading Co to form the Charles Urban Trading Co, taking the rights to Smith’s films with him, at what marked the end of his most active period as a film-maker. In 1904, A.H. Tee took over the lease on St Ann’s Well Gardens, and Smith moved to a new home in Southwick, Sussex, dubbed Laboratory Lodge, where, with finance from Charles Urban, he went on to develop the Lee and Turner process, which had been acquired by Urban following the death of Edward Turner in 1903, into the first successful colour film process, Kinemacolor. Smith proved the new process, which substituted the three-colour approach of Edward Turner with favour of a two-colour (red-green) process, with early test films such as Tartans of Scottish Clans (1906) and Woman Draped in Patterned Handkerchiefs (1908) before giving a trade demonstration of A Visit to the Seaside (1908) on 1 May 1908, followed by public demonstration from early 1909 as far afield as Paris and New York, for which Smith was awarded a Silver Medal by the Royal Society of Arts. In 1910 Urban founded the Natural Colour Kinemacolor Company, which successfully used the process to produce over 100 short features at its studios in Hove and Nice, until it was put out of business by a 1914 patent suit filed by William Friese-Greene, which ended Smith’s film career. In his later life Smith became a Fellow of the Royal Astronomical Society and in the late 1940s was rediscovered by the British film community, which made a Fellow of the British Film Academy in 1955. Smith died in Brighton on 17 May 1959. Hove Museum has a permanent display on Smith and Williamson.